It’s a story which would have been better as a classic episode in ‘The Twilight Zone’, a 32 year old Navy veteran with a high-paying job as a licensed senior reactor operator at a nuclear power plant decides that life is not exciting enough, and chooses instead to live a life of crime on the run. But it’s not a made up story, its real life, and it’s only getting more bizarre. 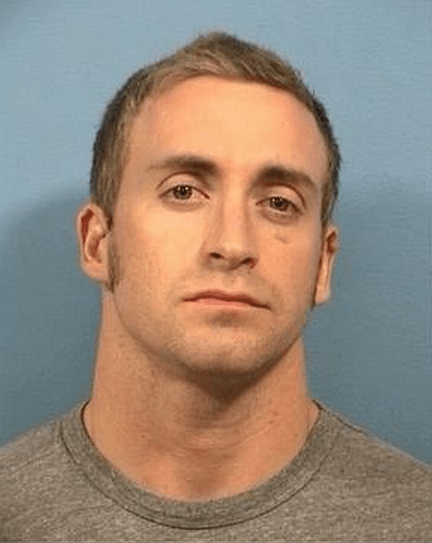 Around 10:00 pm on May 9th, 2012, Michael Buhrman put on a mask resembling an elderly man, and reportedly approached and pointed a .45-caliber handgun at a young woman who was seated inside a parked 2000 Pontiac Grand Am, ordered her out of the car at gunpoint and drove away from a Kohl’s parking lot on the 1000 block of 75th Street in Woodridge, Illinois. A witness followed the suspect and gave police information on the direction the man was traveling. Woodridge officers stopped and arrested Buhrman. They found the loaded gun and Buhrman, who was still wearing a Halloween mask to conceal his identity. Authorities said Buhrman later confessed the hijacking was a “stupid thing” to do and that he was only “thrill seeking.” Buhrman pleaded not guilty to charges of aggravated vehicle hijacking with a firearm, vehicular hijacking, and two counts of aggravated unlawful use of a weapon. Prosecutors said Buhrman faces a mandatory prison sentence of six to 30 years — plus a 15-year add-on because a gun was involved — if convicted of the most serious charge. In July, Judge Kathryn Creswell increased the bond conditions after Buhrman’s girlfriend revealed details of the suspects escape plans to prosecutors. According to court records a motion to increase bail to $1 million was filed July 9th, after the 22-year-old woman told prosecutors that Buhrman said he has access to offshore bank accounts and a private jet, and planned to flee to Chile soon. She said he also recently purchased $100,000 in gold and was overheard making bank transfers. Over prosecutors’ objection, the judge even went so far as to grant a request to allow Buhrman to travel to Nebraska for his 6-year-old son’s birthday party. The defense presented receipts showing Buhrman has retained legal counsel to fight for visitation with his young son, and argued that he only discussed vacationing in Chile once his case is resolved. Buhrman was released on $200,000 bail in July, after paying a $20,000 bond, and ordered to wear an ankle bracelet while in home confinement. Buhrman served two tours of duty on board the USS John C. Stennis, never seeing combat, and was honorably discharged in 2005. The suspect reportedly last spoke with his girlfriend Thursday night, and a neighbor spotted his backdoor open at about 6:30 a.m. Friday, but did not make a report with police. Coal City Police Chief Tom Best said the tampering alarm for Buhrman’s ankle bracelet reportedly went off in the afternoon, but Coal City police were not notified immediately by DuPage County officials, where his case is based. When police arrived at Buhrman’s home at 500 Barber Street in the Richards Crossing subdivision, the monitoring device that had been attached to his ankle was there, but the suspect was not. It was apparent the device had been cut off. Buhrman surrendered his passport, firearm owners identification card, weapons and ammunition, as ordered by the court, to Coal City Police shortly after his arrest. Buhrman’s next scheduled court appearance is set for Oct. 22. Anyone with information about his disappearance or possible location is asked to contact Coal City Police at 815-634-2341 or local police by dialing 911.